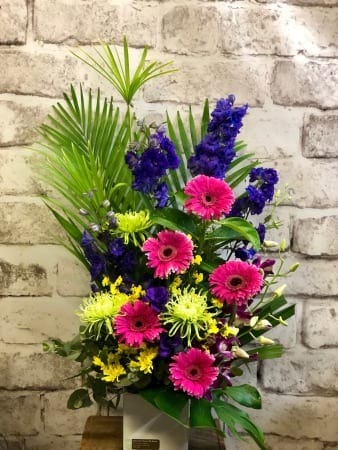 Say I love you and congratulations with Amaranthine`s Sophia Arrangement this stylish design is a pleasure to have in any home, office or hospital room and a beautiful way to welcome a new baby girl into the world! Filled with the happy gerberas, long lasting disbuds, delphiniums, and other seasonal blooms. A unique design from Amaranthine Flowers By Design, a locally owned Newcastle florist. Perfect flowers to say Thinking of You, I Miss You, Happy Birthday, Congratulations, Get Well Soon, Happy Anniversary or Just Because. Your local florist in New Lambton, Newcastle.